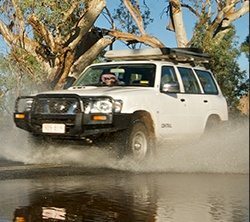 When it comes to 4WD and off road accessories we can tailer a setup to suit your needs and install it all onsite at your home or workplace. Call now for a free quote on any of our products and services. For getting yourself out of trouble or dragging others out. We can supply and fit a wide selection of winches tailored to suit your needs. Great for camping plug and play system, featuring a 12v 100Ah gel battery and built in three way charger. Makes operation easy. Inputs for AC/DC and solar allow you to charge anywhere. Practical to carry around and very handy for roadside emergencies. A compact battery jump starter that can also charge your phone/laptop and can give enough light to find your way around at night. Designed to intake large volumes of cool air from high up and feed it into the stock airbox. Fitted onsite at work or home.